CCM JetSpeed Pro Senior Hockey Skate | Sports Etc. QUARTER The RocketFrame is fully shaped composite shell provides advanced contoured support including improved heel lock for maximum speed. CORE Heat moldable Speedcore 2 Plus is optimized for a contour shape with heat moldable technology for customized support. OUTSOLE Ultralight carbon force with full exhaust for a balance between stiffness and weight with a power channel for superior energy transfer to blade. 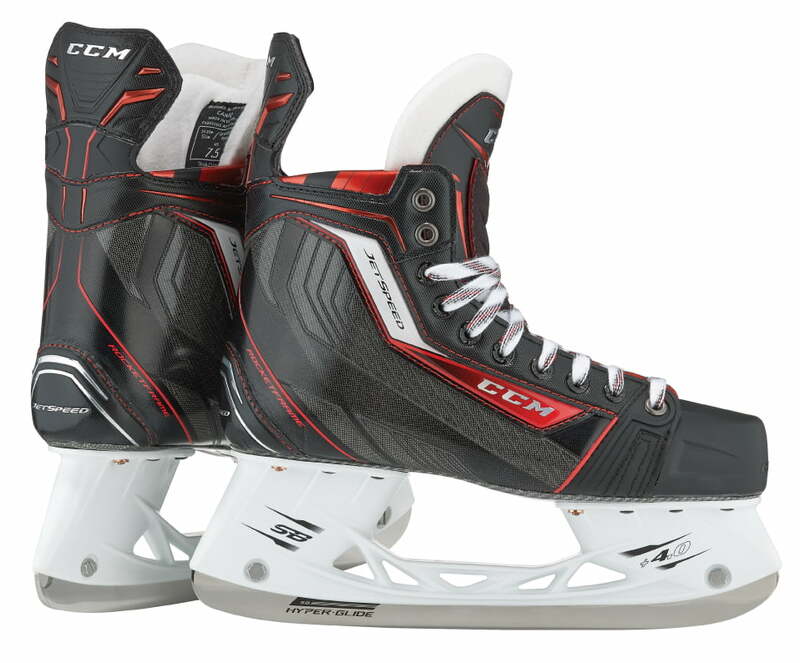 The CCM JetSpeed skate is designed for ultimate speed. The high definition contoured boot shape provides a fit which wraps closely around every segment of your foot. The result is a fit to help generate more efficient power and performance with every stride. The Speedblade 4.0 holder helps to provide a more aggressive angle of attack and a smaller turning radius. The holder has an extra 4mm in height allowing you to make tighter turns. Paired with the HyperGlide Blade, its premium polished runner helps to increase glide and to have a lengthened stride. Sports Etc Performance To Value Rating– 9 out of 10– The JetSpeed has improved from the RBZ of last year. It’s contoured and narrower design makes it a better fitting and more efficient skate. The ultimate lightweight performance skate for someone playing at a competitive level.